Wet and dirty floors are not only displeasing in appearance, but are potentially dangerous. When placed strategically throughout the facility, matting systems are the first line of defence against slip-and-fall accidents and tracked-in soil and debris. According to an industry expert, an effective matting system will help increase the life of a floor and present a consistent, quality appearance. In addition, entrance matting can help lower overall maintenance costs by decreasing the amount of dirt tracked into the building and improve safety by helping to reduce slip-and-fall accidents caused by water collecting on hard floor surfaces. There are varying types of mats, designed specifically for certain surfaces in certain areas of a facility. The most important and common type of matting is entrance matting. By choosing a high-quality entrance matting system, nearly all dirt and water can be trapped, thereby reducing slip-and-fall potential. MULTI-GUARD – This aggressive type of matting should be placed in traffic entry points outside a building. “Scraper mats are your first line of defence, and should remove 40 to 50 percent of dirt off shoes,” says Freedman. WATERHOG® CLASSIC – The second line of defence, this indoor/outdoor matting is strategically placed at entrance points. It is typically comprised of heavy-duty polypropylene and should be placed right inside the door. “This matting will dust and dry shoes and should extend five feet in,” says Freedman. It is also responsible for 60 to 65 percent of dirt removal. WATERHOG® FASHION – This matting works to dust and dry shoes as well. Usually constructed of polypropylene fibres, this matting is the final line of defence. “Most people think that mats are only for entrances, but I believe that a mat should be placed anywhere that the public and non-public places meet, from a kitchen to a dining area, back halls to a lobby”, says Freedman. Anti-fatigue – Available in a solid or sponge-like form, these mats are designed for dry applications where people stand for long periods of time. 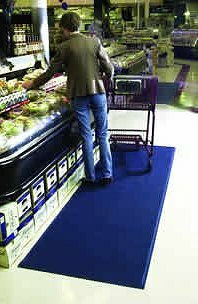 Hotel reception areas, grocery stores, hospitals and manufacturing facilities often use this matting to benefit workers’ health. There are also drain-though anti-fatigue mats for kitchen/food service areas, where grease or water is often present. Protect the surface below the matting. Protect floors from moisture during inclement weather. Matting Systems work to reduce slip-and-fall accidents by collecting water and soil and keeping interior floors cleaner and drier. However, mats that move or crumple up can be a hazard, so special care needs to be taken to ensure that matting remains stationary. “Consider using a rubber pad under the mats to keep them from moving&apos; says Freedman. "If matting is placed over carpeting, Velcro can help." Freedman adds. "However, for overall safety, mats should be checked often, to make sure that they are clean, in place and therefore, functional."